Coffs Harbour Garden Club: Snail Siesta? Recently a magazine article intrigued me....... apparently during extended dry periods there are some critters who shut themselves down to survive. This is called aestivation and is a state of dormancy, similar to hibernation characterized by inactivity and a lowered metabolic rate, which is in response to high temperatures and arid conditions. 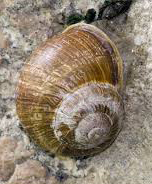 The common snail is just one who goes into an aestivational state. The snail seals up its shell with a parchment-like barrier (epiphragm) to survive dry conditions. This coating protects the snail from drying out (while still allowing it to breathe) and dissolves when there is rain or very humid conditions. Earthworms also aestivate by creating a cavity, lining it with a slime that dries to prevent evaporation from the inside. When it rains this substance dissolves and the worm moves on. In outback Australia when creek beds and dams dry up the frogs go deep and remain there until a rain event - amazingly these frogs can aestivate for years. You may notice yourself that frog activity really increases when the wet finally arrives after our dry winters here on the Coffs Coast. All very interesting - well I think so!